The bathroom is an essential part of any home, and a great place to insert some thoughtful styling. Whether it needs to be a place to relax or to have a sense of organisation, or be a room where you can let your creativity run a little wild, designing a bathroom that works in sync with your personality and needs means making the most out of the functional space. You may have just designed your dream bathroom and are now looking for those finishing touches to make it feel like your own space, or perhaps you’re like me who’s about to move into a house with a less than desirable bathroom and are in desperate need of accessories to improve the situation! There are some interesting ways to utilise your bathroom space and turn it into something of a sanctuary. 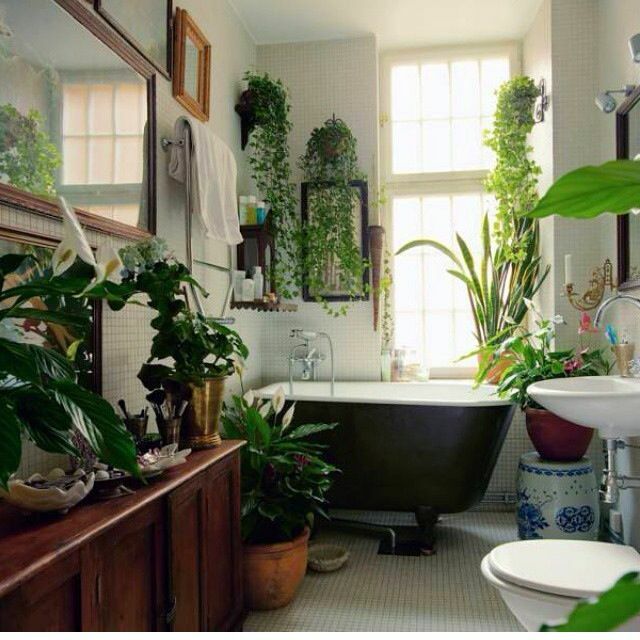 For me the bathroom is a great place to keep plants, all that oxygen in the morning has got to be good for you, right? This image gives me all the incentive I need for a beautiful, overflowing plant haven. If you’re fully willing to participate in the plant-bathroom combo but are lacking some much needed space, a little window sill full of foliage can do the job nicely. I love this image below and how the green of the plants brings out the colour in the tiles, giving a warm welcoming feel to the space. To recreate some of these looks you’ll need some gorgeous pots and planters (and of course the plants too!) Maison du Monde have a nice selection of hanging planters, an interesting way to display your plants, it’s also great to introduce more plants to your bathroom without taking up a lot of floor or wall space. For a natural feeling to your pots, this earthenware collection by The White Company are a great range of colours and textures, as well as size, making them perfect for filling up with a whole variety of plants and flowers for your bathroom. They’ll sit nicely on a window sill or if you have the floor space, arranging some on the floor, stools and surfaces to create mixture of heights will give a lovely overall look. Storage is a must-have in a bathroom, whether or not you have a lot of room to play with, there are ways to find space even when you thought you had none. If you can’t add any permanent solutions to your bathroom, you’ll be able to find a great range of non-permanent ideas to accommodate your needs. If you live in a rented house, and don’t have the option of changing your bathroom to your own style, you can use your storage to do this. This shelving unit from Ikea is simple and contemporary, and can let your accessories do all the talking. It’s an easy item to adapt to any style that your bathroom may already be designed in. This glass cabinet is a great piece to have if you’ve got some room. It looks more like a display case than an ordinary bathroom cabinet, making a feature in the room, and allowing you show off your ornaments and accessories. If you are really lacking in space, a small trolley with a few shelves is a sweet idea. This little number from Baileys lends itself to the industrial style, and would look great with a few plants hanging over the edge. I love the use of these wire baskets in this image, they’re a contemporary version of the woven basket that you so often find in a bathroom. They keep the space feeling light, whilst still being very useful. These copper versions from Habitat have a great shape and will keep your things organised in style. Another quick way to add some personality, as well as some organisation, is with a few trays, to help keep your products and toiletries at bay. I love this hexagonal wooden tray, it works as a blank canvas to show off any pretty toiletries or perfumes you might have. This metal tray from H&M Home is so sweet and has some lovely detailing in the border. A few of them would look great lined up on a shelf of a window sill with a few vases of flowers between each one or at the end. Accessorising your bathroom is a lovely way to give your space that extra added boost of style. It allows you to redecorate your bathroom even if you can’t really redecorate, turning the room into your own, individual space where you can really make your mark. Over the weekend I went to visit my friend in his new flat, a lovely space in the centre of town, but just missing a little something. He asked me what I thought was the best, least expensive way to create a home that actually feels like home, even when it’s rented. While you can’t always do a lot of permanent changes, there are small but effective accessories that you can buy that will not only fill up the space, but will make it feel more cosy and inviting. Candles, cushions, rugs and other accessories are a lovely way to add some individuality to a space that doesn’t belong to you. They will automatically create a welcoming space, and are easy items to pack up if you move. I’ve picked out some cheap, but chic portable home accessories to help turn your house a home. Candles on the whole are an easy way to change a rooms lighting and atmosphere, building a collection of candles in all shapes and sizes will show off your individuality and character. This cactus candle is super stylish and a fun decorative piece to have in your home. Make it a focal point by surrounding it with simple, long stem candles. If buying a designer set of table and chairs seems like something you’d rather not do, you can dress up your existing set in a few simple ways. Getting some cheap and cheery seat cushions will make a creative space out of an ordinary one, so will buying a tablecloth, they’re both an easy way to inject some personality into a rented house and will make the whole space feel homier. H&M Home have some rather fun, contemporary and reasonably priced low-key items that are perfect for a quick fix. I really like their range of seat cushions and tablecloths, plus they’re cheap enough that if you get them a little messy you don’t need to feel bad about it. You can create a more settled-in feeling in a house by decorating the walls, it’s a great way to show off your style and taste without taking up too much space. I think this round copper mirror and Barker and Stonehouse is something special. The copper tones will help make a cold space warm, and will complement some leafy green plants. 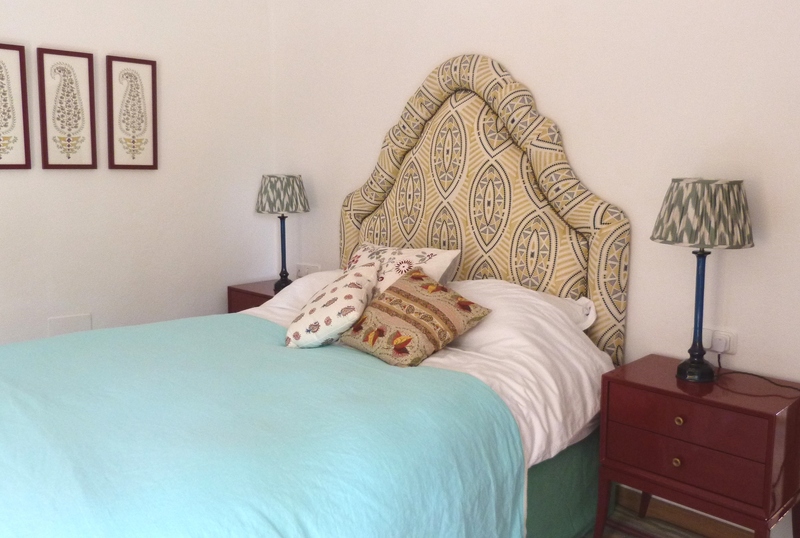 It can also be made to work with contemporary and bohemian style interiors. For something a little more alternative and intriguing, an interesting art piece like this wall trellis from Habitat is an inexpensive way to add some style to a plain wall. You could even get creative and begin to add you own personal touch to the piece by weaving in some fairy lights or fake foliage. Display photographs or postcards in an interesting way with these brass picture frames from Rockett St George. You could use one as focal point among some simpler frames or create a whole feature wall by using a few in different sizes. Rugs are just a great solution to make any home feel more inviting for both style and practical reasons. Firstly they’ll help make the room feel warmer, and they’ll also help to reduce an echoing sounds. Style-wise they’re perfect to introduce some fun to your floors, especially if you don’t want to spend too much or you aren’t able to change the primary floor materials. I like these two simple but sweet rugs from Ikea that are ideal for making a blank canvas a little less blank. And finally, add a simple floor lamp, with a softly coloured bulb and turn a cold corner into a warm happy place. These Rutbo floor lamps from Ikea will work in all sorts of interior schemes, get two in the different sizes to create some diversity. From lamps to rugs, there are so many solutions to making a house feel like your own, and so much fun to be had in the process!